Roller coasters have evolved since the days when the Switchback Railway and Loop the Loop occupied the block where the Cyclone is now, but as far as ride tickets, they don’t make ’em like they used to. When the New York Antiquarian Book Fair opens today at the Park Avenue Armory, among the treasures for sale will be a collection of elaborately illustrated tickets from Coney Island rides and amusements of a century ago. 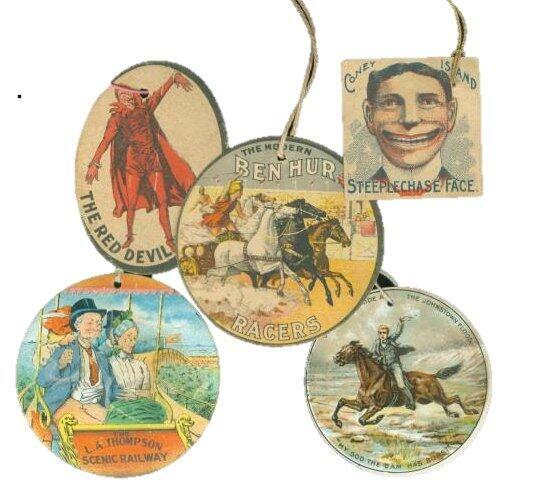 The collection is being offered by Eclectibles (Booth A44) as part of a selection of New York ephemera. The tickets came equipped with strings for securing to a shirt or coat button and are wonderful souvenirs of old Coney Island. The rides and attractions represented in Eclectibles collection include such long-vanished Surf Avenue thrillers as The Ben Hur Chariot Race (1908-1923) and the Rocky Road to Dublin (1907-1912) built by William F. Mangels, Jackman’s Shooting the Rapids (1898-1901) and Loop the Loop (1901-1910). The Star Double Toboggan Races (1904-1906), the world’s first two-track racing coaster, and the Red Devil Rider (1907-1923) are among the Bowery attractions. A number of L.A. Thompson’s Scenic Railway and Steeplechase Face tickets round out the collection of 14 tickets, which is priced at $3,500. Considering that an especially rare ticket and advertising tag for Coney’s early attractions can sell for several hundred dollars on eBay, the price is fair. The last time ATZ wrote about one of these hard-to-find tickets was in 2011, when a die cut tag from Dreamland’s Bostock Arena was snapped up for nearly $400 in the last few seconds of an auction. 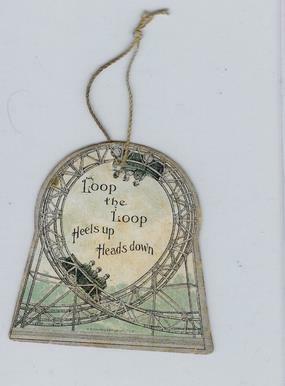 Currently on eBay, seller childhoodthings is offering a collection of Coney Island tickets, including Loop the Loop (“Heels up, Heads down”), the County Fair Musical Railway, L.A. Thompson Scenic Railway (“Ain’t It Lovely!”) and Steeplechase Park for $1,000. It would be nice if a museum here in New York bought them. They are certainly museum worthy. It was the golden age of tickets. And ticketbooths!